SmartPark LGA Parking offers great rates for secure vip parking at LaGuardia Airport, SmartPark is Open 24/7 and offers Free Shuttles. SmartPark LGA Is a full-service valet parking operation. They check you in and assist you with your luggage transfer. Being a secure vip parking at LaGuardia Airport the staff will warm up and cool your car before you arrive depending on the weather and time of year, ensuring that your car is ready when you arrive to pick it up. Customers are treated to VIP treatment. Once they've dropped off your car with the valet you are provided with complimentary tea, coffee, or hot chocolate, a smartpark driver will help you stow your luggage aboard the airport shuttle. The shuttle then takes a quick trip to the appropriate airport terminal. Once customers return from their travels, they simply catch the same shuttle back to the lot, where you will find you car climate controlled and ready to go. Upon Arrival: When you pull into our lot at 28-11 Linden Place, a SmartPark team member will greet you, please present your InstaPark confirmation to the attendant who will process a parking ticket for you. You will be asked for your name, reservation number, return date/time and your airline. The SmartPark associate will provide you with a claim ticket and phone number to call upon your return to LGA. Upon Returning to LGA from your trip: AFTER you have retrieved your luggage please call (877) 535-PARK (7275) and request a pickup. Please confirm the terminal number when disembarking your plane as there are 4 distinct terminals at LGA. This phone number is also located on the SmartPark parking ticket you were given at check-in. When you call us, the dispatcher will confirm where you will meet the shuttle. Car was ready and heat was on when we arrived on a cold rainy night. Didn’t have to wait long for the shuttle service. Car ready when we arrived. SmartPark LGA Parking is great! They offer door to door service and they do it with a smile. Everyone is happy and they go out of their way to make sure that you're happy with the service that you receive. This is the only airport parking that I will ever use again when traveling from NYC out of LaGuardia airport. I love that I was always treated with respect and like I was a VIP. There was someone there to greet me when I pulled into the lot at SmartPark LGA, they parked my car for me, gave me a free coffee and got me on my way to the airport immediately. Pick up was great too, I caught the shuttle back literally right as I stepped out of the airport and then had a nice cool car waiting for me in the parking lot. I haven't had a lot of luck booking airport parking in the past so I was a bit cautious for my next trip but SmartPark LGA really came through. Both drop off and pick up were fast and easy. The shuttle was there when I needed it both ways and the staff made sure that I arrived with time to spare. Stellar service from some really great employees at SmartPark LGA Parking! I really liked that there was a 5 hour grace period, otherwise, I would have had to pay for an entire day for using just an hour and a half more than the allotted time. I would recommend this site to anyone looking for parking near LaGuardia airport. Two things that SmartPark LGA has that a lot of other airport parking doesn't, 24/7 security and 24-hour drop-off and pick up and because of these features, I'll use them from now on. Deciding to use SmartPark LGA was the best decision! It helped me to start my vacation off right and made my entire trip less stressful from the get-go. Thanks so much for the great experience, I will definitely be back soon! The cost and value are great and you get VIP parking at SmartPark LGA Parking! Check-in and out was seamless and drop and pick up from the airport were great too. I loved that I was offered a free coffee when I arrived. Everything on my way to my vacation went smoothly with SmartPark LGA Parking. Easy drop off, great friendly staff, affordable daily rates, close to LaGuardia airport. The only complaint I have is that I had to wait a bit longer than expected to be picked up at the airport to get back to my car. It was a huge relief to know that there are camera's in the parking lot to 'watch' what's going on all the time. It made me a lot more comfortable leaving my car there and to know that my car would be safe while I was away. The staff member I spoke with on the phone to make my reservation was very helpful and answered all of my questions. I was very happy to see that SmartPark LGA Parking offered 24-hour service since I was catching a red-eye and would need to park my car in the wee hours of the morning. When I arrived I was greeted immediately and an employee helped me with my bags and then parked the car for me. The staff were quick to offer me a free coffee, tea or hot chocolate and make sure to get me on my way ASAP. Great parking facility to drop off your car, catch the free shuttle that's offered and make it to LaGuardia airport with time to spare. When you return a quick phone call will get you a pick up mere minutes that will take you right back to SmartPark LGA Parking. I wasn't sure what to expect when I decided to drive to the airport and leave my car behind but I have to say, as we drove up to the lot I knew that everything would be alright. The price was on point, and the service was exceptional. I've been spreading the word to friends and family that this is the parking lot that they should use. Actually looking forward to using SmartPark LGA Parking for my next trip! I was pleasantly surprised at how kind and friendly all of their staff were including the manager who took care of my check-in. Definitely will use them again in the future. I have been using SmartPark LGA PArking for quite some time now and have never had a bad experience! Checking in is smooth and always quick and there is always a shuttle ready to take you the short distance to the airport. Upon return, I have always been picked up within a few minutes. We just used SmartPark LGA Parking for the fourth time in a row and we are again very happy with the level of service and professionalism. Our shuttle bus driver didn't rush us out, instead, he helped us find a luggage cart, load it and then made sure we knew where we were headed. There's no other airport parking company that does this for their customers, SmartPark is the only choice from now on! SmartPark LGA Parking is the way to go! It's safe, secure, cheap and the staff including that manager are all very hands on. They know that you are often in a hurry and don't ever make you wait. The best in airport parking by a landslide! Thanks again for another wonderful experience! We love using SmartPark LGA and have never had a bad experience. It's close to the airport and so affordable and then top it off with the best airport parking staff we have ever met! Thanks for another wonderful experience SmartPark, we will see you again soon! 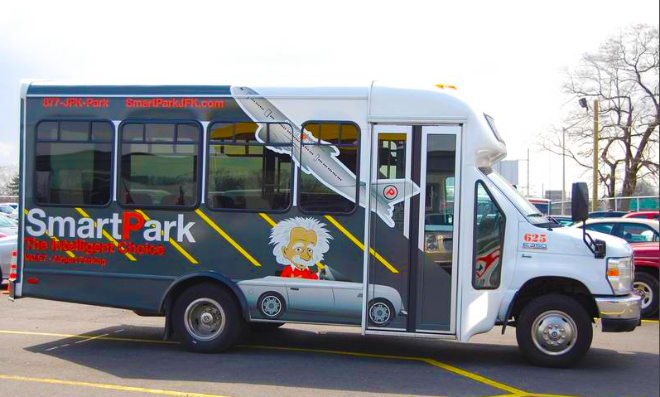 SmartPark LGA is easy to get to, has great attentive staff, is VERY affordable and shuttle buses running all of the time so you don't have to wait around either on your way to the airport or back from it. Great experience all around! Sometimes parking and getting to the airport can be a huge headache but not with SmartPark LGA Parking! The valet service is unreal and they offer you a complimentary tea, coffee or hot chocolate while employees load your luggage into a shuttle bus for you! I felt like I was a VIP for sure! I will NEVER park anywhere other than SmartPark LGA Parking again! We arrived home to NYC after a huge snowstorm and the staff took the time to clean off my car and have it warmed up for us when we arrived back to their parking lot! They even helped us load our luggage into the car to get us on our way faster. We had quick service with SmartPark LGA both with our drop off and our pick up. We didn't have to deal with a bunch of drop offs and pick up locations and both were right at the door rather than having to cart our luggage all over the place. 5 stars for sure! I was shocked to learn that SmartPark LGA Parking offered valet service to all of their customers. What a great idea! All I had to do was pull up to the lot and the attendant unloaded my luggage for me and then parked my car while another attendant loaded my luggage in the shuttle and then I was on my way. The service at SmartPark LGA Parking is the best we have come across in airport parking yet! Everyone is happy and goes out of their way to make sure you are too! We were dropped off at the airport with tons of time to spare and our pickup happens literally within 5 minutes of us calling for it. Best airport parking experience ever! The manager on duty at SmartPark LGA Parking was so helpful and actually drive us himself to the airport when we had just missed one of their shuttle buses. Now that's customer service! We have used several airport parking lots in the past and haven't been overly impressed with any of them until we found SmartPark LGA! It's cheap and all the staff are very friendly and helpful even going out of their way to make sure that you get to the airport quickly and smoothly! I travel almost 50 percent of the time and always leave my car with SmartPark LGA. The lot is in a great location and the staff really knows how to take care of you. I highly recommend this parking lot to anyone traveling out of LaGuardia airport. The entire experience that I have had with SmartPark LGA has been great and not just once but 3 times now! Everything always runs smoothly and I am in and out on a shuttle to the airport quickly. Pick up runs just as smoothly too. This is the only airport parking I will be using from now on! I travel a lot and after a terrible experience with another airport parking lot decided to give SmartPark LGA Parking a chance and boy am I glad that I did! Nothing but good things to say here! 5 plus stars from this guy! I can't say enough good things about deciding to park my car at this SmartPark LGA Parking lot! Everything was great, from the online reservation system to the very attentive staff who went out of their way to make me feel comfortable. It was like I was part of the family and not just another faceless sale to them. I'm always worried about what might happen to my car when I leave it long term parking when I'm on my way out of the country but SmartPark LGA but all my worries to rest! The parking lot is clearly well maintained and has great security which put my mind at ease immediately! The staff is knowledgeable and they were willing to answer all of our questions, the manager on duty was very friendly and went out of his way to make sure we were happy. The parking lot is a short shuttle ride to the LGA airport and they literally dropped us off right at the door to our terminal. They even helped us unload our luggage and get it onto a baggage cart so we could easily get it to the airport. It's not easy to find an airport parking lot that offers both affordable rates, excellent customer care, and valet services all together but SmartPark LGA Parking is that place that has it all! Thank you for a great experience, we appreciate it more than we can say! SmartPark LGA Parking is the best option in a car park when you're traveling out of LGA airport. The price is more than REASONABLE and fair. I'm glad that we decided to book ahead of time before they were all booked up which happen frequently. A great experience from start to finish! Can't say enough great things about SmartPark LGA Parking! I've been telling everyone I know who is traveling to check these guys out! Everything about this place is great. The staff is VERY professional and they always deliver top-notch service. For sure worth using the next time, you're traveling out of LaGuardia airport. Loved SmartPark LGA Parking! Easy to use and wonderful staff! We will only use these guys when we travel from now on. SmartPark LGA is close to the airport, it's clean and clearly well maintained. All of this made it an easy choice for us to use when we were headed out of NYC on our way to sunny Hawaii for our honeymoon. Thanks to everyone working that made it easy for us to park and be on our way! I was more than happy with my choice to use SmartPark LGA Parking. There is tons of additional parking so that the lot is very well lit even at night and there is 24-hour security which totally put my mind at ease about my car right away. Thanks SmartPark for a great parking experience from start to finish! I was so happy that SmartPark LGA has a grace period of 5 hours for parking. When our flight was delayed I was worried that we were going to be charged for an additional day but instead, we were told by the valet employee that we had nothing to worry about because they had a grace period and we would in fact not be charged for an additional day at all. Loved that there were no hidden fees with SmartPark LGA Parking. What you see on paper is what you are charged when you're leaving. There's no 'tricky way' that these guys are going to try to soak you for more money before you leave the lot. Worth using for sure! The best and most affordable airport parking in all of NYC. It's only a short shuttle ride away from the LGA airport and everyone that works there is friendly and quite helpful. They helped us transfer our luggage from our car to the shuttle quickly and painlessly. Totally worth checking out! SmartPark LGA Parking is a well-run business where the staff takes the time to REALLY look after you. They are sincere and caring and more helpful than anyone working at a competitor's airport parking company. Thanks for everything, we really appreciated all of the hard work that your company did for us! So happy with how everything went when we decided to use the SmartPark LGA Parking lot. It was an easy entry and exit upon our return. An added bonus was that we didn't have to wait in till we were well on our way home for our car to be warm because the SmartPark staff made sure the car was warm for us when we got back to the parking lot. Love how close it is to the LGA airport! They made it easy to park and get to the airport in just minutes. I was thankful for the valet service that SmartPark LGA offered because I am not a fan of parking in other lots where I have to try to fit my SUV into small spaces. The valet was very accommodating and helpful, he even insisted on helping us get our luggage from our vehicle to the shuttle bus that was there waiting for us. I was more than happy to pay to park at the SmartPark near LaGuardia airport because it delivered exactly what it promised. It's close to the airport, the staff is friendly and they offer valet service to park your car for you! Plus they treat all of their customers like royalty no matter who you are. Everything about using SmartPark LGA Parking was wonderful. Making my reservation on the phone was the best choice for me and the staff member that I spoke with was very helpful and made sure I chose the right dates. She then told me what time I need to be there to get to the airport on time too! This is a low-cost parking lot that offers everything that you get with the ones that are crazy expensive! I was impressed from the minute I made my reservation online and received a phone call from a staffer who wanted to make sure that I knew how to get to them. SmartPark LGA is the lot to choose when looking to park and fly. After looking everywhere for the best deal in airport parking I found this gem. The lot is a decent size, the staff is knowledgeable, polite and overall just great! Couldn't have been more comfortable leaving my car here because I knew I would come back to find my car in the same condition I left it. The outstanding staff made my entire experience so much better than I had expected. The lot is close to LGA airport and it's super affordable no matter how long your stay! This is a must use park and fly for anyone traveling out of LaGuardia airport! The large shuttle bus that SmartPark LGA has is perfect! It was able to take my entire family and all of our luggage in one trip on the short drive to the airport. This made getting everyone in the same place at the same time much easier and everyone was on time too! I had been searching and searching for airport parking that wasn't going to gouge me and then I found SmartPark LGA! The added services and safety features are great and really made me feel comfortable leaving my car there for the duration of my trip. Thanks to the amazing staff who worked hard to get me exactly where I needed to be as well! I was worried about parking my car for a week near the airport, especially in New York where you often hear of car break-ins and cars being stolen but the very helpful staff quickly made me feel much better about everything. An added bonus was that it was very reasonable too! Parking anywhere in New York can be a headache and parking near the airport more so, but not with SmartPark LGA. The entire experience was top notch in my books! I wasn't sure what I was in for when I made my reservation online to park at the SmartPark LGA Parking lot in Queens when I was headed out on a business trip, but I can honestly say that I was pleasantly surprised and happy with what I got. The staff was great and the location is a short shuttle ride to the airport. I wasn't stressed for time and it was cheap too! Thanks for helping me out! This is the best park and fly that serves the LaGuardia Airport by far! It's close, it's cheap and the staff treats everyone wonderfully! I highly recommend this to all of my family and friends. The LaGuardia SmartPark is so affordable which is great! Being able to access the lot late at night/ early in the morning was also a must and these guys even warmed my car up for me before I got back into it after my trip! I chose SmartPark because they offered both security which includes 24-hour security guard and video surveillance. This was the top thing that I was looking for and I got that with SmartPark LGA Parking and their rates are also the best out there which was a HUGE bonus! I love that with SmartPark it doesn't matter if you have one traveler or more, you don't have to pay extra to get your group to the airport because the shuttle is included in your daily price. Oh, and the staff is wonderful, so helpful and kind! It's great when you get to SmartPark LGA Parking on Linden Place in Queen's you quickly see that you don't have to even drive your car into a spot because the staff is going to do it for you. It's true valet service and how everyone should feel when you're headed out on your next vacation. Let someone else take care of you, it's the best! I love how easy it is to get to SmartPark LGA Parking. The directions on the site were easy to follow and understand, which made it a breeze to get to. What was even better is how close Linden Place, where it's located, actually is to the airport, which I never realized before. It only took a few minutes to get to the airport by shuttle and we arrived ahead of schedule too! I love that you can book online with SmartPark LGA, it makes things so much faster and easier for everyone. I also really enjoyed my free coffee and of course the part where I was made to feel like a VIP by all of the staff working when I arrived and when I was on my way home after my trip. I wasn't sure that everything would work out since I booked my parking online so I arrived early and was pleasantly surprised to see that they were expecting me. Everything went smoothly and I left feeling like I had left my car in good hands! I'd 100% recommend using SmartPark LGA Parking. Such a great overall experience here! I've used other park and fly companies in the past and they just don't match up to SmartPark LGA Parking. Everyone is so great and you get exactly what it is that you are lead to believe at the low price you're quoted. There aren't any hidden fees like some other lots have. This is the ONLY park and fly place I will ever use again! the rates are more than reasonable, the staff is top notch and the location is perfect! So glad I found this gem! The BEST customer service hands down! Thanks everyone for starting our vacation off right! Leaving our car at home while we were away on vacation wasn't an option because we weren't going to have a ride home when we returned. Although we were both a little leery about leaving our brand new car in a parking lot for just over a week we couldn't have been happier with the entire experience! Choosing SmartPark LGA Parking made the entire start of my much-needed vacation a very happy and relaxed one! I'm so glad that I chose to use these guys cause every step of the process ran smoothly and helped to set my mind at ease and into vacation mode. Thanks guys for everything! I love how convenient it is to park at SmartPark LGA Parking! This is a great place to park for so many reasons but the main one is that I can park and catch a shuttle to the airport quickly and efficiently. An added bonus is that I love all the staff that works there, they are friendly and actually care about you! This is the best parking lot that I've ever used when traveling from LGA Airport. Everyone was great and answered all my questions and concerns quickly and efficiently. This will for sure be my go to from now on when I'm looking for airport parking for any trips in the future. This place deserves more than 5 stars! The entire process was so easy. I arrived early because I thought it was going to be a process just to get parked and shuttled to the airport but that wasn't the case at all. The staff were so helpful and check in was a breeze and we were done in no time at all. This is the best parking experience that I've had yet! If there was a way to give the LaGuardia SmartPark a higher star rating I would for sure! Fast, friendly staff and easy to use, Everything ran so smoothly that we were able to make it for our check in with tons of time to spare. Using SmartPark LGA Parking is a great choice for so many reasons. I loved that they will make sure that your car is either heated up or cooled off depending what time of year it is and the awesome shuttle service. I would highly recommend to anyone looking for long-term parking for their next vacation. I can't get over how easy SmartPark LGA Parking is to use. I did everything online before we got there and everything ran smoothly when we showed up. The added complimentary tea, coffee or hot chocolate is another example how SmartPark LGA Parking goes a step above any of their competitors! I have to say that I am so happy with my parking experience with SmartPark LGA Parking. I have never been treated like I'm a VIP before and it was great! All customers are treated the same and truly have a VIP experience each and every time you park with SmartPark LGA Parking. SmartPark LGA Parking is the best long-term parking out there today! The best part is that it's convenient and they offer you a free shuttle for yourself and your luggage to and from the airport. SmartPark is the only choice for LaGuardia airport parking. I Loved, loved, loved my experience dealing with the folks at SmartPark LGA Parking! They are super helpful and willing to go that extra mile to be sure that my car was parked safe and sound while I was away on my trip, giving me peace of mind. Definitely, recommend!!! SmartPark LGA Parking is the only choice for long-term parking when flying out of LaGuardia Airport. It's open 24 hours a day, 7 days a week. It offers full-service valet parking which made me feel like a VIP right from the start. Will definitely use them again soon! I couldn't be happier with my choice to use SmartPark LGA Parking. The onsite staff was very helpful and I felt comfortable leaving my car there since there is 24-hour onsite security. Excellent experience. All treated me like a VIP! If there was a way to give this place more than 5 stars I would. Couldn't believe how fast and easy it all was. I showed up about 3 hours before my flight was supposed to leave because I assumed the process would take a long time. I was checked in, parked and in my shuttle bus all in less than 15 minutes and the shuttle bus ride over to the airport was just under 10 minutes also. I got there with plenty time to spare! Thanks guys! Once I found this parking lot I knew I found a real gem. Good stuff guys! :) Everyone here was really helpful and nice and go me into the shuttle bus and at the airport in record time. I'm always worried about being late for my flight, but I wasn't late this time! My apartment complex has parking but it didn't feel safe for me to leave my car there unsupervised while I went on my trip. We don't even have a front desk or security guard like some condo buildings do so I knew there was literally nobody to make sure my car would be alright. Taking it to SmartPark LGA gave me peace of mind that I would come back from my trip and still have something to drive! Convenience is the name of the game when it comes to airport parking so when I found this spot I knew it was a great one. Being so close to the airport, it was bound to be expensive or so I thought! The price was pretty reasonable considering the location and everything that came along with it! I had to park my car for about a month while I went to Brazil and knew leaving it on my street wasn't going to cut it. I needed it to be somewhere where it was going to be under surveillance and all that good stuff. Security here is pretty amazing and they took great care of my car. Definitely using this spot again when I'm heading out of town! I had the BEST experience here and I'm so glad I decided to book a spot here for my car! Will be coming back! 5 stars! Perfect service, came back to find my car just how I left it. What else could I ask for? Really a great parking lot I never would have thought I could get prime NYC parking so close to a major airport for this price. Everyone that works here is awesome and the facility itself was great too. I only left my car here for a few days but it was well worth the price and then some. The location was so easy to find especially since I already know Queens so well! It was right there on Linden and I knew right away it was going to be a safe spot for my car to be. I called to book parking here and it was smooth sailing from then on. They explained the whole process to me of getting there and switching to the shuttle bus and also gave me really good directions (I'm not from NYC) so I got there really easily. Left my car there for about a week and had no issues when I went back for it. The one star I give SmartPark LGA is one star too many. My car was valet parked on SmartPark LGA lot from 12/1 - 12/14. It cost me $365.00 which I paid online in full before driving to the lot. I picked up my car on 12/14 and immediately noticed new, extensive scratches on the front, driver side, near the headlight. Via emails, I explained and submitted photos of the damage to SmartPark LGA on 12/14 and 12/15, respectively. Adam Smith of SmartPark LGA telephoned me on 12/16 to deny any responsibilities. He also implied that those scratches came into existence after I left his parking lot on 12/14. What do I gain by falsely accusing SmartPark LGA for causing damages to my car when I have already paid in full in advance? Any businesses, big or small, that have integrity, are concerned about providing reliable services to its customers, would have taken a different approach. SmartPark LGA has proven that it is not such a business. Please keep my situation in mind if you decide to valet park your car at SmartPark LGA. Better yet, stay away from SmartPark LGA if you value your car at all. I've been telling everyone I know to use this place!! So awesome and great service! For a carpark in NYC it was way cleaner and brighter than I thought it would be. People that work here are nice too, they helped me bring my stuff from my car to the shuttle. I'm always scared to leave my car in parking lots but when I saw how well-kept it was, and all of the security and cameras they had and all that I knew it would be just fine. when I came back to find my car just how I left it I was happy and relieved. It's not easy to find parking close to any airport in a city this big - the lots are usually full about a week ahead of time but with SmartPark LGA I was able to find a spot just a few days beforehand. When I pulled up they parked my car for me it was great! Friendly staff, fast service, manager on site who answered all my questions and I got to LGA just in time for my flight. 5 stars for sure!! The best thing about this lot is that there was active security there I knew I could rely on to keep watch over all of the cars. The lot itself isn't that big so I knew it wouldn't be too much of an issue to be watched over and I was right. My car was just fine. Would for sure park here again! Everything about the process was really seamless. From booking online, to parking my car, to getting my luggage into the shuttle bus which they helped me with, it was all really easy and way simpler than I thought it might be. Excellent service which is why I gave it 5 stars! I didn't expect to find valet service at a parking lot like this but being so close to the airport it makes perfect sense. It was pretty full service too, the attendants also helped me move my luggage from my car to the shuttle bus so I didn't have to do any of the heavy lifting myself. Never thought I would trust a parking lot with my truck but I took a chance and the right one. This place is great. The carpark itself was really bright which I knew made it easier for the security to see what was going on - if anything. This made me feel really good about leaving my car here and I didn't worry about it at all while I was gone. Not only that but the location was really easy to find! Anyone going to LaGuardia will tell you that the traffic is out of control and driving yourself can be a nightmare. The closer you get to the airport the worse it gets. That's why being able to leave my car here and then getting a shuttle bus the rest of the way was really helpful and made everything really seamless. I didn't have to worry about anything since my parking spot was booked ahead of time online. AMAZING service! Couldn't be more happy about the service! Hands down the best place to park to get to the airport super fast. The best carpark service maybe in New York City! Don't park anywhere else it's a waste of time! I fly out of LaGuardia on an almost weekly basis and so I'm always on the hunt for a parking lot that will make it quick and easy for me to get to the airport after parking and I think I've finally found it. Great experience, amazing service and a pretty reasonable price. I'm glad I don't have to search anymore! Top service in the city, really great time. Brought my car here after a suggestion from a friend and I'm really glad that I did. Can't imagine parking anywhere else now it would just feel really inconvenient to me. Honestly everything about this lot was pretty much perfect - the location (I live right in Queens so it was great) the people that work here, the kind of service I got from everyone, how easy it was to get to the airport and everything was just plain perfect. I couldn't have asked for a better experience. Knowing there was a camera on the premises made it so much more comforting for me leaving my car there. The staff was eager to answer all the questions I had both over the phone and after I got there - I just wanted to be sure my car would be safe and it was! Really a great place with a great service and I couldn't want anything more from the experience. It was great overall and I've been recommending it to everyone I know. The security guard was right there as well as the other attendants and I knew it was a super safe place to leave my car. I couldn't believe how simple the whole parking and flying process really was, and the staff made it so much easier. Really great experience and I'm glad that I booked a spot at this lot! I have an SUV and squeezing it into lots can be a challenge at times, especially when it's on the smaller side. I was worried about this place at first but the spaces are a bit wider than regular ones so my car fit in just fine. It was great! As soon as I pulled up I knew I was going to be comfortable leaving my car here and I felt better right away. I'm usually scared to leave my car anywhere but this loot was safe and was also really easy to find and get to. Awesome shuttle bus, too! The thing I loved most about this lot is that there was a large shuttle bus ready to take me to the airport right after I parked my car. It made everything so much easier and brought me basically right up to my terminal. I definitely made my flight this time! The most important thing about parking your car close to the airport is safety. Leaving your car behind in a city like New York is scary but the helpful staff here put my mind at ease. Not only that, but the price was amazing and it was easy to find.